Wicca, also known as White Witchcraft, is a faith based around nature spirituality. It is a harmonious, peaceful, nature-loving and beautiful way of life. Witchcraft has its deep roots in Ancient Pagan Ireland and those of us who follow this path are very in tune with the powerful forces of nature, with a knowledge of herbs and oils and their magical and healing properties. Being Wiccan simply means following a spiritual path, empowering yourself, harming no-one and taking responsibility for your own growth. As a White Witch I follow the path of the Wiccan Way, and honour the Earth, the Sun and the Moon as One. I do not cast spells for people. 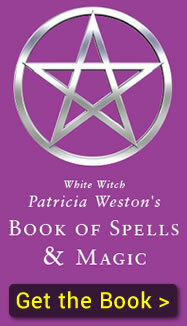 I have written a book; White Witch Patricia Weston's Book of Spells & Magic which details all you need to effectivly cast spells and practice magic for yourself.